Just finished Arts and Crafts bookcase in Black walnut. Nice job on your bookcase. The grain pattern is beautiful and the finish looks great. -- CurleyJoe, "You only learn from your mistakes"
Sweet! Maybe somebody will figure out how we can put pictures on line that are not sideways. I have the same trouble trying to get that. The arch is really nice! -- Usually my shop looks like who-dunnit-and-run, but sometimes it looks nice. 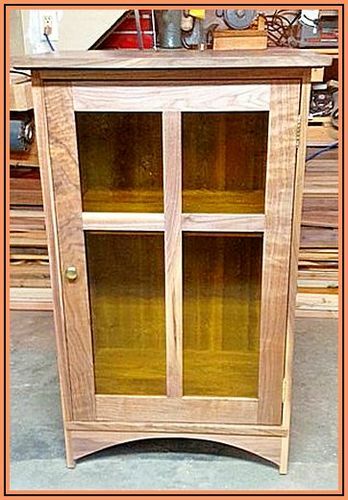 This is a wonderful bookcase and so beautifully done and it displays a lot of nice craftsmanship. Nice! I love black walnut, and have a bunch in the garage, waiting for a project. As far as posting pics right side up, I copy them from the camera to my pc and then open them in Paint. Then I save them again as something other than “DCIM….or whatever your camera uses” with a different name. This does two things- the pic is saved as a pic in the correct orientation, and the geocaching information (your location in the world) is removed.